·	Jaho Coffee and Tea (665 Washington Street and 1651 Washington Street, both Boston; 197 Derby Street, Salem): Jaho had us hook, line, and sinker on the pumpkin spice latte train this season when they started hawking their gourd-based treats last month. With the “#BeBasic” campaign ushering in their PSLs and pumpkin spice gelato, we think the folks at Jaho might be in on the joke. Add an extra shot of fall by taking the ferry from Long Wharf to Salem and visit the North Shore branch—just beware of any witches. ·	Fall Football: Whether you’re heading to the Heights to cheer on Boston College or making the trek down to Gillette Stadium in Foxborough to root for the Patriots, Boston is an ideal place to throw on a North Face and watch some pigskin. The Patriots take on the Miami Dolphins this Sunday, September 18, while the BC Eagles return home September 24. Tom Brady is allowed to come home to play at Gillette on October 16 against the Bengals. ·	Apple Picking: Nothing looks better on Instagram than a group photo in the middle of an orchard with everyone in your squad wearing roughly the same plaid and corduroy combo. Metro Boston is home to many venues, but nothing is as close as South Natick’s Lookout Farm (89 Pleasant Street, South Natick). Whether you’re in it to choose your own Macintosh bushel, gorge on apple cider donuts, or squeal at the cute farm animals, Lookout Farm is one Mayfair-filtered dream. 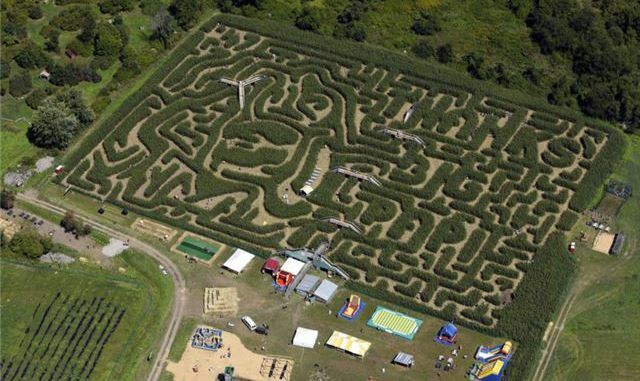 ·	Davis Megamaze (145 Redstone Hill, Sterling): Even our corn mazes know to root, root, root for the Red Sox. For those of you looking for an afternoon outside of the city, head to Sterling any weekend between now and Halloween for a chance to walk through this year’s corn maze, which is honoring David Ortiz for his years playing at Fenway. If getting lost in a corn field manicured in the shape of Big Papi isn’t your idea of fun, check out the fire pits, Zip Line, and delicious barbeque!